A lifelong Homewood resident, Cleveland told how he grew up living in the faculty apartments at Samford, where his father, Tom Cleveland, was longtime dean of admissions and director of financial aid. The younger Cleveland enrolled at Samford after graduating from Homewood High School, located directly across Lakeshore Drive. 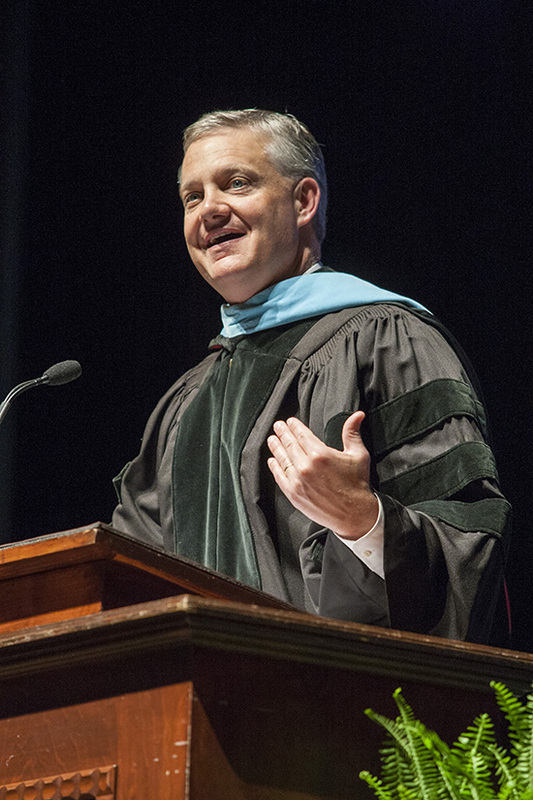 He earned master's and education specialist degrees at the University of Montevallo and returned to the Homewood school to earn his doctorate in educational leadership at Samford in 2003. The former Samford A Cappella Choir member received the 2014 Outstanding Administrator Award from the Alabama Music Educators Association for his commitment and support of music education. Cleveland, whose career has included being a teacher, coach, principal, and since 2004, superintendent, said that in order to form relationships with students, teachers should know about their activities, hardships, interests, and "what life is like for them when they leave school and go home." "Find ways to motivate them. Know when to push the gas and when to stomp on the brakes," advised Cleveland, who said he is amazed at the dedication of educators in the Homewood school system. "Little things mean a lot," he said, recalling when some fifth grade teachers stopped by a park where their students were playing and cheerleading, and a scenario in the critical care unit at Children's Hospital where a kindergarten student lay recovering from a freak electrical accident. "Her first request was for her teacher to come sing her the 'Good Morning' song, and the teacher did because she was in the waiting room with the principal and family members." * On the first day of school, the parents are sending you the best that they have. * Help them reach their unique potential. * Don't let them give up. * Encourage them when they need encouragement. Push them when they become stagnant. * Give them the support they will need. * Help them foster a positive attitude. Recognize their potential. "When you feel the pressure of impacting the world, getting in the grades, managing time and deadlines, discipline, professional and personal issues, and have made an investment in relations with your peers, go to one another to find help," he said he advises his teachers. To the Samford arts and education graduates, he said, "I say the same to you. Whatever course you venture out on, be it in the arts or education, make that course one of excellence. Make it one filled with positive investments." Provost Bradley Creed announced that four Samford faculty members in the audience will retire this year: education professor Martha Ralls, music professor Paul Richardson and art professors Don Rankin and Lowell Vann. The program included presentation of the President's Cup award to art major Caroline Reid Donaldson as the graduating senior with the highest grade point average in the senior class. In a Samford first, three seniors were named to receive the annual John C. Pittman Spirit Award for exceptional scholarship and leadership abilities. All three were a part of the education and arts commencement program. This year's winners are Hannah Joy Barnette, Sabbath Joy McKiernan-Allen and Kaleigh Elizabeth Warwick. Mandy Stanley, an education major from Leighton, Ala., gave the farewell address. She suggested to her fellow graduates that if there is one thing she has learned about God while at Samford, it is that he has a plan for each of their lives. "Go with it," she said.